Piaggio has started the production of the Aprilia SR 150 scooter in India. Aprilia, a subsidiary of Piaggio Vehicles Pvt. Ltd has reportedly started the production of its Aprilia SR 150 scooter in India. The company is producing the scooter at their Baramati pant in Maharashtra and is expected to launch the product in the third quarter of 2016. The scooter was first showcased at the 2016 Auto Expo in Greater Noida. The SR 150 is likely to be powered by the same 150cc engine found in the Vespa 150 currently on sale in India. The engine in the Vespa produces 11.4hp and the same specifications is also expected on the Aprilia. 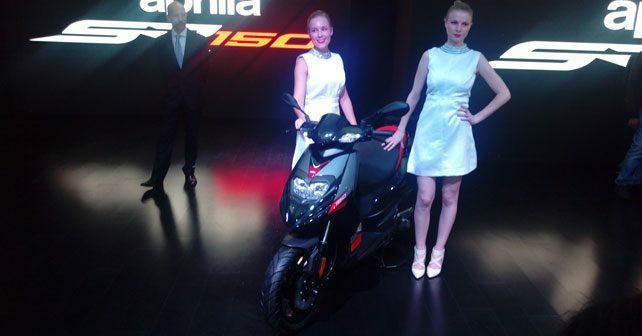 The SR 150 will be available in tow trims in India and both based on black and white dual paint schemes. Aprilia has given the SR 150 sporty design features with heavy front fork suspension and 14’ inch black alloy wheels with disc brakes at the front and drums at the rear. While the Vespa 150 currently starts at a price of around Rs. 87,000, the Aprilia is also expected to be priced similarly with the highest variant nearing the Rs. 1 lakh mark.